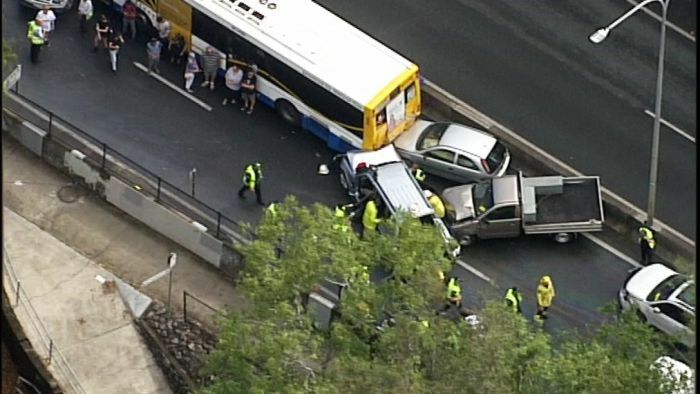 A crash involving 20 cars and a bus is causing traffic chaos at Jindalee in Brisbane’s west. Emergency services were called to the crash on the Centenary Motorway about 2:15pm, as heavy rain, strong wind and hail hit parts of the region. Twenty-seven people have been assessed by paramedics. Four patients are being treated at the scene — including a woman in her 40s and a man in his 50s. Emergency services are urging drivers to avoid the Centenary Motorway where possible. Brisbane City Council Deputy Mayor Adrian Schrinner said authorities were still assessing the incident. “There were multiple vehicles involved including a council bus,” Councillor Schrinner said. “I understand there was a car in front of the bus which stopped suddenly.